At its E3 2016 showcase event, Bethesda revealed new details about its upcoming mobile card game, The Elder Scrolls Legends. The strategy card game will feature characters, creatures and lore from the entire Elder Scrolls universe, and it will feature both multiplayer and single-player gameplay, including a single-player story mode. Specifically, the story mode will follow a Moth Priest named Kellen on a quest to escape from dark cultists. As players progress through the story mode, they’ll earn new cards for their decks. During matches, players will work to destroy the opponent’s avatar before their own avatar can be defeated. 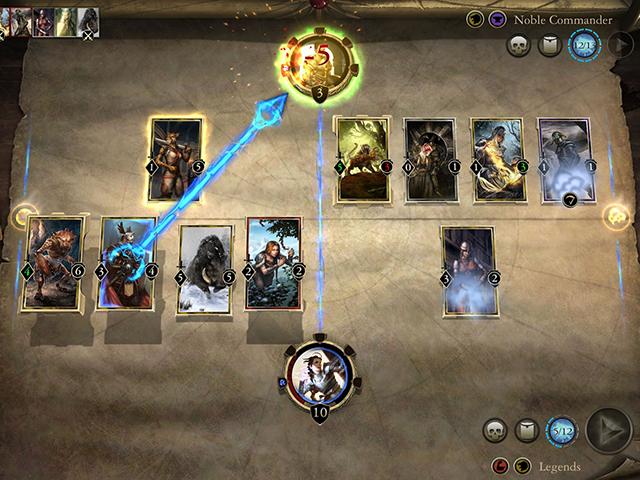 Each player begins with a hand of three cards, and they can spend a limited number of Magicka points on each turn to cast cards to the playing field. The field is split into two lanes, and some lanes may have special effects on the battle. As players cast cards, they can choose to attack enemy cards in the lanes, or attack the enemy avatar itself. Users can select their avatar from the nine main races of Tamriel, and they will receive rewards “complimenting that race’s play style and unique in-game strengths.” As players complete battles and collect cards, they can edit their decks to fit their play style, and they can upgrade their cards to make them stronger. Overall, The Elder Scrolls Legends will feature a story mode, practice mode, versus battles, a solo arena and a versus arena. The game will launch on iOS and Android smartphones and tablets, as well as on PC, later this year. The Elder Scrolls Legends is currently in closed beta, and in honor of E3, Bethesda will add more users to the beta this week. Interested users can sign up for the beta here.